Recent observations by NASA’s Chandra have found much of the Milky Way’s missing mass in the form of a vast halo surrounding the galaxy. It has been known for many decades that the amount of material which we can see in a galaxy is not enough to account for the speeds at which various stars and clouds orbit the centre. Objects towards the edge should move slowly and objects near the core should move rapidly, which is what we observe in our Solar System. In reality, though, we see that the outer edges move significantly faster than simple orbital mechanics would suggest, and the most likely explanation is that there is a lot of mass unaccounted for, spread throughout the galaxy and upsetting the calculations. Current leading cosmological theories predict something called Dark Matter, which is a form of matter that does not interact with the rest of the universe in any way except through gravity, making it invisible and intangible. But even when dark matter is taken into account, the Milky Way galaxy still spins too fast. The Chandra Observatory, a space telescope designed to observe the universe in X-rays, has now solved the mystery by spotting a vast cloud of normal matter spread in a halo around the entire Milky Way galaxy. This matter is in a gas form, and so thinly spread out that it is invisible to direct observations. However, when Chandra observed a number of known X-ray sources in the sky, an analysis of the colour spectrum of their light revealed absorption lines caused by oxygen ions in the light path. Astronomers estimate the temperature of this hot gas at between 1 and 2.5 million Kelvins, or several hundred times hotter than the surface of the Sun. It is also huge, containing a mass of gas of at least 10 billion Suns, and possibly as much as 60 billion Suns. 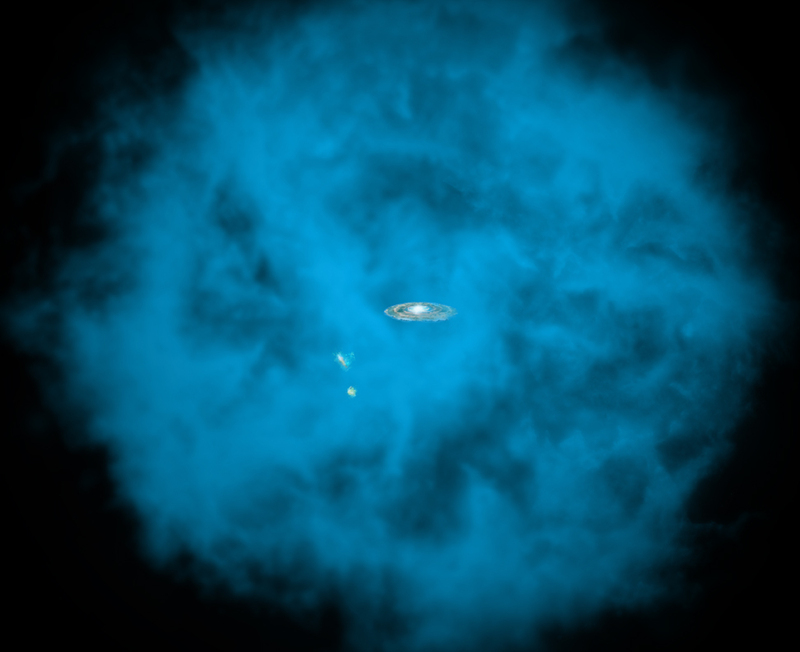 This gas halo is distinct from a smaller halo of less hot gas which astronomers have known about for some time – this warm halo is well studied, and others like it have been seen around other galaxies.